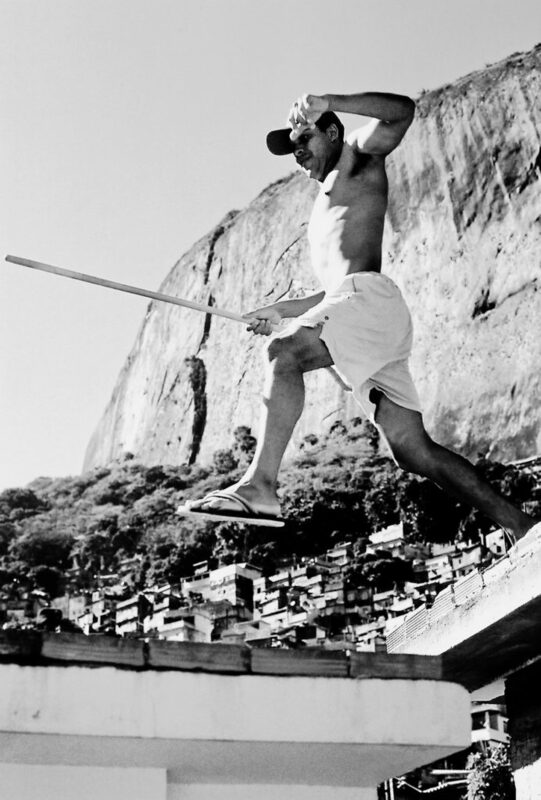 Editor’s note: See the film trailer for Carlos Beltran’s Rocinha documentary here. The largest slum in South America, Rocinha is controlled by drug gangsters who strut the streets toting a range of weapons, from a .22 caliber pistol to a semi-automatic machine gun. Stern, a KU Global Scholar fluent in Spanish, had traveled overseas before — Paraguay, Argentina, Bolivia, Brazil — but live in a favela? Not yet. Her parents had had questions: We’re not putting a death sentence on our daughter, are we? They directed their questions to Paul Sneed, KU professor of Portuguese, who had made the arrangements for Stern to live in the slum. He’d spent a year in Rio as an undergraduate. He had also co-launched an education program called Two Brothers inside Rocinha. He knew the community well. And he believed it to be safe. Two of Sneed’s contacts offered their homes to Stern and her associates, global street photographer Gary Mark Smith, based in Lawrence, and videographer Carlos Beltran. Stern and Smith connected through a Career Day event while Stern was still in junior high; Smith, who is known internationally for his photography, has mentored her ever since. After landing in Rio, Smith and Stern took a taxi to Ipanema. Beltran arrived the next night. A Venezuela native and KU alumnus, Beltran was sanguine about living in Rocinha. He has been inside shanty towns all over Caracas, filming a documentary called “The Slum Culture.” Here he would film a documentary on the making of the book, as well as take pictures. More than 100,000 people live in Rocinha, which is built on steep hillside in an area about the size of Old West Lawrence. The brick buildings are small, closely fitted and colorful. Splashes of blue, orange, aqua and purple brighten the horizon. Smith and Beltran immediately started shooting. They could take pictures as they pleased as long as they honored one rule: Don’t shoot without a guide. The gang prohibits pictures of drug activity, conducted openly in the streets. On the surface obeying would be easy; they wanted their project to spotlight the people living and thriving inside the favela — not the drug lords. At night Stern shared a bed with two women, while Smith and Beltran slept on a nearby roof. The noises of Rocinha continued past midnight, the city pulsing with music. In the mornings they woke to a hundred roosters crowing; Smith says residents house chickens on roof tops. In Rocinha residents pirate electricity. Bundles of tangled cable dangle from windows and rooftops and wrap around telephone poles. The trio had to duck under or stepped over these knots as they trekked across the favela with their cameras, Smith said. Kites fluttered from roof tops. People carried caged birds to outdoor bars. Motorcycles zipped by. Little girls swung on swingsets, young boys kicked soccer balls, and teenagers clutched surfboards as they shuffled to the beach. Smith sheathed his camera in a plastic bag — the first time he had ever concealed it –for his first few days in Rio. But this didn’t last long. About a week into the trip, Smith decided to strike out without a guide. Once on the street he started taking picture openly. Smith has covered seven wars and nine volcanic eruptions, and he said he liked to up the ante to get the better photo. While Stern and Beltran were on the beach jogging, Smith walked the street alone. 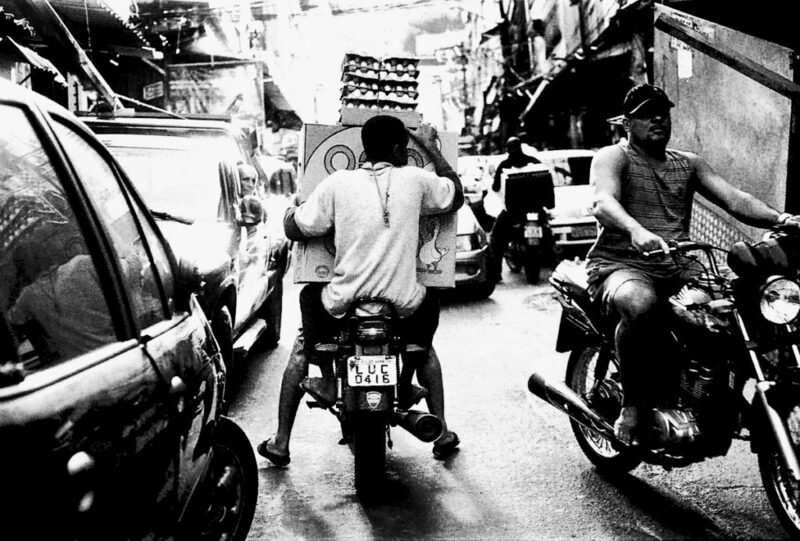 He took 95 pictures in 10 minutes: one was of a street sweeper; another was of a three-person family on a motorcycle. Within minutes three men swaggered up. They grabbed for his camera. They yanked. There was a tussle. Smith brandished an ID and they let go. The lifted shirts, showing guns. “Come with us,” the leader said. Later that day Stern and Beltran met Smith back at the favela. Smith didn’t have his camera. Stern and Beltran were startled. What if the gang wanted their cameras, too? Throughout the trip there was another threat looming: Brazil is currently undergoing a Favela Pacification Program, a campaign designed to eradicate gangs to install community police units. So far the FPP has plucked gangs from more than 20 favelas, according the U.S. State Department. Some gangs have resisted violently: setting cars and buses ablaze, and shooting at police — the sort of thing Smith would have loved to capture. A few days passed. Then a gang member approached Smith. “Do you want to meet the boss?” he asked again. The gang in Rocinha is Amigos dos Amigos (friends of the friends). Antonio Lopez, known on the street as “Nem,” is its leader. Last April, 200 police officers searched Rocinha for 12 hours looking for him, according to the Associated Press. The three were to meet Lopez at a gang-sponsored street party on the group’s second to last night in Rocinha. They trudged up the hill where the gang was stationed. The gang leader, Antonio Lopez, 35, was surrounded by a dozen friends. There were no visible guns. Stern told Lopez about the project. This was where her all-nighters studying Portuguese paid off. She said the project was not about the gang. She said they wanted to capture the community, not the crime. They spoke for 10 minutes. Then the gangster gave Smith his camera back and shook his hand. As the trio walked back to the party, Smith whispered in Sterns’ ear.